For every 100 people using a credit card branded with the American Express, Discover, Visa, or MasterCard logo, there are 58 co-brand/affinity card users. How consumer confidence has improved as credit card debt dropped 15% from its peak in 2009. 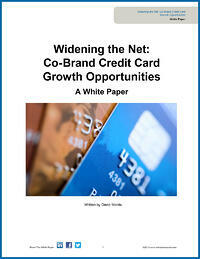 Packaged Facts consumer survey results show that the percentage of consumers using co-branded/affinity credit cards has fallen from 55% to 43% from 2009 to 2013. How American Express and JP Morgan Chase gained market share between 2008-2012 by enhancing credit card programs targeting the affluent. How interest rates, spend limits & fees were an important consideration in 74% of credit card user's decisions to choose their last co-brand/affinity card.